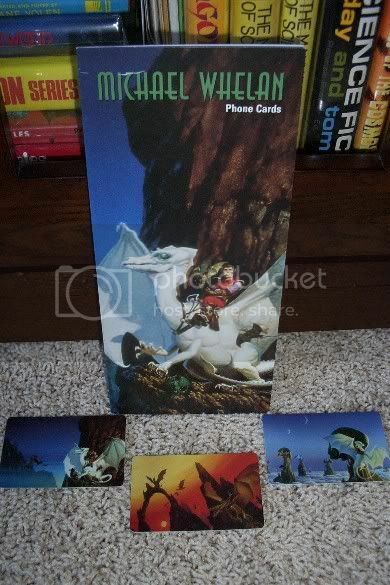 In 1995 PATCO or Public Access Telephone Company issued three 'comic phonecards' (prepaid cards) based on Michael Whelan's artwork for three of the Pern novels. They bear an expiring date of January 6, 1996 and are considered collector's items, especially since only 2,000 were made of each card. In my honest opionion this is an affordable collectible. Of this last card 500 signed copies exist; whether they come on top on the 200 (unsigned) ones or if there are 1500 unsigned and 500 signed ones is not entirely clear to me. 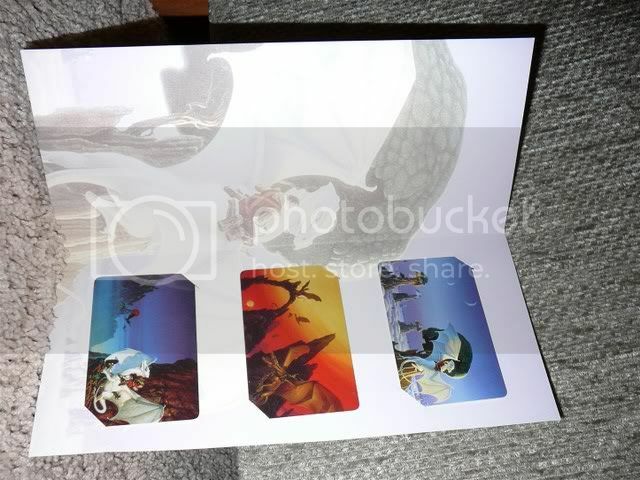 As I said these cards are collectible items and the artwork (printing on the plastic card) is of good quality. I bought mine through eBay of a seller called Peter Comparetto. Go here to visit Peter's eBay store (search for Whelan). The cards are in unused/mint condition. These are a nice set. Phone cards are something of collecter items in and of themselves. These are great for the Pern value. I was sent an email from a friend ;) to go and see Peter's Ebay store a while back... I thought these were lovley and so I bought all three of these cards and have them in a display frame together now. I would love to get the rest of the McCaffrey cards that are out there for sale by the other artist, I have several of them now but need a few more. :drool: :drool: :drool: I wants!!! Any more info on the folder thing with the cards in it, Becky? Is there art on the inside and/or backside? How many were made? Price? Any further data would be welcome as it should be mentioned with this Collecting Highlight, I think. Hans, always glad to help and add more info. :) I was going to do a highlight on these at one point but got sidetracked on another item and then another item and another..... :) Glad that you got one posted for them since it was taking me forever to get to them. I'm right there with you, Maelin. Haven't seen any come up on eBay though. Hmm, I'm very curious is the seperate cards were made in batches of 2,000 and if this set with its holder comes on top of that... that would mean that, if the cards 'come loose' from the presentation folder, there would be 3,500 each effectively (with only 1,500 presentation folders in existence). I pulled the cards out of the folder and the numbers on the back read 905 - 1558 of 2000 on the Moreta, 906 - 1558 of 2000 on the White Dragon and 907 - 1558 of 2000 on the Weyrworld. So the 905, 906 and 907 denote the picture on the front since Hans' Moreta back also has the 905. Hmm, but your cards say x of 2000; doesn't that mean 2000 full sets were made of which 1500 in a folder? Or am I thinking the wrong way? Maybe it means that the count of 2000, and 1500 is the amount of cards that were made, and of those only a few were put into those LOVELY presentation folders like yours Becky...you lucky girl!!! I know this is a REALLY old post/highlight... but....I just bought one each of these 3 cards from the seller listed below!!! :bouncy::bouncy: He only has 3 or 4 left if anyone else is interested... One of them is signed.. I also got fine copies of Weyrworld and The White Dragon for sale (unsigned). And personally I am still looking for the gift box! I am still looking for the gift box! What do you mean, gift box? Or do you mean the folder? Yeah, I mean the folder.